This commercial video, produced around 1986, features Seymour Papert answering questions from teachers. This discussion explores many of Papert’s recurring themes of children, computers, and powerful ideas. Papert also interprets Piagetian theory for the assembled practitioners. 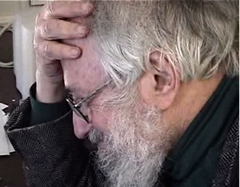 Seymour Papert: Should we sit down? I think what I learned most from Piaget is that the essence of learning is appropriation. The essence of learning something is making it yours. It’s taking it in, and integrating it into your way of being, and thinking, and seeing things. I did not understand, at the beginning, the importance of the tremendous difference in styles between children. It was only in the course of the Logo experience itself that I came to understand how very different the paths that different children would follow. As soon as you created an environment in which they could proceed in different directions. We now see children … I think we see quite clearly that children can learn mathematics in radically different ways. Some through movement, and some through static designs. The difference between Sprite Logo and classical total geometry is a beautiful example of something that has very different reactions from different children. Some like the movement, and the dramatic action. Others like the detail and the precision. We should be able to offer each individual the opportunity to learn in a way that just feels right, and is right, in terms of the particular style of thinking and learning. Speaker 3: Some people say that the use of computers in schools will make learning even more abstract, even more analytical than it has been. Seymour Papert: Of course, in our culture, generally, the stereotype of computer programming is logical, analytic, precise, left-brain stuff. That’s the way people generally see programming. In Logo, we worked very hard to make something that doesn’t fit in with that stereotype. We try to make something that can be used by people who want to think analytically, who like this logical ordered plan, top down thinking. They can use it that way, but, others who like to think in a different way, more right-brained, more spatially, starting from the particular, and coming down to the general, they can use it too. The evolution of Logo has been to open up more and more possibilities of that sort. Naturally, since, in traditional programming, it is very much the left-brain kind of thing, we had to work hard to find, slowly, ways of doing the other kind. Sprite Logo is an example, and the use of Logo in word manipulations, and the new Logo Writer is another example. The use of Logo in Lego and in music are yet other examples, but now, I think we have very conclusive … A large range of very conclusive, compelling examples of how computation, even programming, can be done in a way that doesn’t fit into that stereotype. Sherry Turkle in her Second Self, in fact, shows us something very interesting too, that her study of adult programmers confirms what many of us know impressionistically from dealing with programmers, that programmers aren’t such left-brained people either, that this idea that the way you write a program is by structured, analytic reasoning just isn’t true. Some people think like that, but many of the virtuoso programmers of the world don’t think like that at all. We have an important issue raised here, namely, when you think of building a computer culture in our schools, that’s building a learning culture imbued with computational ideas, we have a responsibility to see to it that the version of computer culture that gets in there is not an arbitrary stereotype that was made up by some computer scientist somewhere, or some people in industry who decided that the right way to get software written is to adopt assembly line techniques of highly structured production of programs, and have persuaded the world that that’s the way to do programming, and this gets injected into our school system, which is expected to prepare programmers to go off and make software on software assembly lines. Whatever the rights and wrongs of these strategies for the software industry might be, as educators, we cannot allow that kind of process to determine the model of programming, and the model of these computers that colors the computer culture in our school. Speaker 4: Okay. Do you think then, that right-brain students, and most frequently, girls, will learn to love the computer, and use it in some other creative ways? Seymour Papert: Of course, I think that left-brain/right-brain has to be understood with a certain grain of salt. You can’t take it too literally. I think any talk of styles of thinking has to be qualified by saying that you never see them in a pure form, except in pathological cases, and everybody has a mixture, and some were in the middle. Nevertheless, people have dominant and preferred ways of thinking. Our education system often doesn’t allow people to exercise the way of thinking and learning that is most powerful and preferred by them. It does them a lot of damage by forcing them into one or another, but not their own style of thinking. Speaker 5: What kind of things have you seen? Can you share some things with us? Seymour Papert: I’d like to talk a while about what I call the Big Classroom Put-down. The pressure on teachers to present one way of thinking as the right way has, as a consequence, that those people who think differently might go away with the lesson that their way of thinking is the wrong way. I think that, in fact, very many people did go away from school with this lesson. One of the most harmful consequences of our traditional educational methods is just that. I can illustrate this by some personal experiences. One of these is the reactions that people have made to my book, Mindstorms. Many people have told me what they think is good and bad about the book. Of these comments, there’s one kind that had given me the greatest personal pleasure. This is when people say that the book let them think that it was okay to think the way that they think, that it was okay to be themselves, in a certain way. I find this a wonderful thing. In some ways, this book then legitimated the ways of thinking that had always, often secretly in their own minds, pursued. In many ways, this makes it liberation. What makes me really mad about the classroom is telling children that there is one right way to think. This is what I call the Great Classroom Put-down. Speaker 6: We all work very hard to avoid this put-down, but how are we to tell? There are a lot of subtleties involved here. Can we see any clues from the way children respond? Seymour Papert: They respond in very different ways. Some, these are the most unlikely ones, give up altogether. They feel so bad about the put-down, that they eventually give up on learning. They drop out in one way or another. The luckiest ones are the ones that [inaudible 00:10:08] enough to go on believing that their way is the right way. The unlucky ones are the ones who, in the end, are brainwashed into having doubts about themselves. Once they start having these doubts, they’re on the path that’s going to lead to believing that they’re not as good as other people, a thought that never comes into the mind of the very young child. They come to believe they’re not good at math, or not good at writing, or even not good at learning. That is nonsense. If they really had not been good at learning, they would never have learned to walk or talk, or reason. They’d never have got as far as this classroom where they are told that their way of learning isn’t the right way. Speaker 5: In spite of, is some students make it. Others learn to get around it. Seymour Papert: Let me give you an example. I know many good writers who came close to being damaged by being told that the way to write is like this: You make an outline, and then you follow the outline to make your text. This is pretty good advice for some people. It matches the way some people think, but some minds, they like to mess around with words, and let the text grow by some kind of organic process. For people who’s minds work like that, the outline is a constraint, not an aid. Fortunately, I know a lot of people who found a way around this situation. You write the text first, and then you write the outline, so that you can hand in your outline to the teacher, and say, “Look. I wrote it, and I followed it.” The teacher would be amazed at how well you did your job. You’ll get your high grade, but in the meantime, you have undermined the element of honesty and trust that should be at the basis of all good teaching relationships. I did something similar in a physics course. I really hated those things they call experiments, those rituals where … You know how it works. You have to follow instructions from a book, or a sheet about how to connect up the apparatus, and then you have to make measurements, and in the end, you calculate something, and you prove that so-and-so’s law is true. For me, this had nothing to do with really doing science, and nothing to do with thinking about what was behind these laws we were supposed to be proving. A friend and I invented something similar to doing the outline afterwards. We decided we’re not going to do a single experiment. We’re going to fake it. We’re going to make up the measurements. We’ll put them in our lab book, then we’ll do the calculation, and we’ll prove the law is right. You might think this is simple cheating. Cheating it is, but simple, it wasn’t at all. In order to make up numbers that sounded plausible, especially when the instructor began to be suspicious, you really had to understand what was going on. You couldn’t make up any old numbers, or the instructor could see immediately those aren’t numbers that could’ve happened. I think I learned more physics from that course, from this course where we spent the whole term faking, than I learned from any other official course in science. What should we call this? It was a way of getting around the Great Classroom Put-down, by faking. It was a way of personalizing the science. The science course was designed as a routine experience where we would do what we’re told. We’d follow instructions, and get results. Nothing personal about that. My friend and I turned this into something very different. By setting ourselves the project of not doing the experiments, we personalized the knowledge that we were acquiring. We personalized this experience. It was something that was challenging, and important to us. We were drawn into a process where we really wanted to succeed, and we did. In fact, although I learned more from that course than from any other course I remember, I didn’t really learn science from courses at all. I learned about science by doing it. I learned about it by building a telescope when I was a high school student, by messing around with chemicals in the garage. I think that’s much closer to the kind of Logo environment that we try to create. In doing that, it wasn’t about faking. I really tried to make the telescope. It really worked. We really looked at the stars. There was no faking in doing that, but it did lead to another kind of faking, and another kind of undermining of trust and honesty in school. In the science class, there was a dilemma that I remember very, very vividly. When we came to talk about science, would I refer to my own experiences, which were so different from the classroom, or would I refer to what we were supposed to have done in class, and what we read in the textbooks? It was a serious dilemma. If I referred to my experiences, I risked the put-down. If I referred to the classroom experiences, I felt dishonest, that this wasn’t the real thing. Some years, I followed one policy. Some years, I followed the other. As it happened, in some years, I got prizes at school, and some years, I nearly flunked. Speaker 3: Don’t you think children need structure? They need to know what’s expected of them? Seymour Papert: Am I saying that we should allow children to think whatever they like? To do whatever they like? Surely, as educators, we have a responsibility to guide children into deeper, richer, “better” ways of thinking. Does this talk about different styles, different ways of doing things, and respecting them all mean we have to give up standards? Give up guidance? Not at all. To say that there are many styles of good thinking does not mean that there are no styles of bad thinking, that there are no bad ways of doing it. Think of painting, for example. I don’t think that any sensible art educator, or artist would say that there is one good way of painting. There are obviously many styles, many schools, but I think everybody would agree that there’s such thing as bad painting. Paint splashed on canvas is not art, just because it’s paint on canvas. The same is true of writing. It’s permissible to follow a tight outline, and produce a very well organized text. It’s permissible to let your text grow, and to make something which in the end, conveys to the reader, the feeling of a certain, more organic, rounded structure, but it’s not permissible to ramble on in ways that can’t be followed by a reader. Whichever style the writer adopts, there’s a duty to be in touch with the reactions of the reader. There’s a duty to think of how will what I write affect somebody who reads it. Even if that somebody is only me, who will re-read what I might be writing in my diary. The skill of writing has a lot to do with becoming sensitive to the reactions one’s self, or other people might have to the words one’s put down on paper. Of course, this only happens if it is allowed to happen. In many classes, teachers impose on children the style of programming. It’s laid down that the way you write a Logo program is super procedures and sub-procedures. The way you write a Logo program is to follow this outline invented by the teacher, or derived from some book. Of course, if you do that, you’re not going to see the differences of style between the children. On the contrary, instead of the Logo experience being liberating, it’s going to be another example of the Great Classroom Put-down, and you’re going to lose the opportunity of using Logo and the differences of style in programming to elucidate the more general issues of style and accountability in other subject matters. Speaker 4: Other than the advantages of programming, what other kinds of things come out of working in a Logo environment? What other kinds of advantages? Seymour Papert: When we talk about styles in painting, and in writing, it’s hard to make really concrete to somebody who hasn’t already understood it. The objective part of what has to be done, whatever style you adopt. In the computer context, one has the advantage of an easily stated, concrete objective way of judging whether the program, irrespective of style, is acceptable. It has to work to begin with, so that when we discuss with children the question of style in the context of programming, we can look at the different programs that different people in the class have written. We can compare them. We can bring out the fact that some were written in a highly analytic, top-down, very structured way. Others were written in a looser style, but they worked. We see very clearly what is not permissible. It’s not permissible to make programs that don’t do anything. Through the experience of programming, we can draw children and teachers into a discussion of style, of differences of style, of how they express each individual’s desires, and each individual’s way of being, the way of working. At the same time, we can easily focus on the element of objectivity on the criterium that overrides the choice of style. You’re writing a program in order to get results. I’ve found that programming provides a context in which the issue of style, the personalized aspect, and the overriding objective accountability aspect can be discussed in a particularly concrete way, and can be carried over from this discussion into other, more traditional areas. Speaker 5: You’ve often said that as more and more computers become commonplace in our schools, then the structure of the schools will change. Do you expect this new culture to change our children as well? Seymour Papert: Much of my research has been about finding ways to personalize knowledge. Helping people articulate what they know inside themselves about the way that they themselves think. This is what Logo is really about. It’s about making learning environments in which people can think and learn in personal ways, which they can talk to one another about how they do it, which they can share with another, both what is the same, and what is different. People often ask, “How will Logo change children?” I have a slightly paradoxical answer. It shouldn’t change them. It should let them be what they are. We do too much of futile attempts in schools to impose change on children. Why do you want this new instrument to do some more?